Chinese Vice Premier Li Keqiang met with former British Prime Minister Tony Blair on Thursday, hoping China and Britain could further boost cooperation and mutual trust. Chinese Vice Premier Li Keqiang shakes hands with visiting former British Prime Minister Tony Blair in Beijing, March 25. During his meeting with Blair, Li said China and Britain were both influential countries in the world and should take the opportunity to increase cooperation and mutual trust, which would benefit the two countries as well as the world. China would unswervingly follow the path of peaceful development and pursue a win-win strategy of opening-up, and actively participate in international cooperation on tackling the global financial crisis, climate change and health care, said Li. Li appreciated Blair's efforts to "advance China-Britain relations," and said he hoped the former British prime minister would continue to play an active role in promoting exchange and cooperation between China and western countries. China and Britain last week inaugurated their first higher-level strategic dialogue during British Foreign Secretary David Miliband's visit to China. 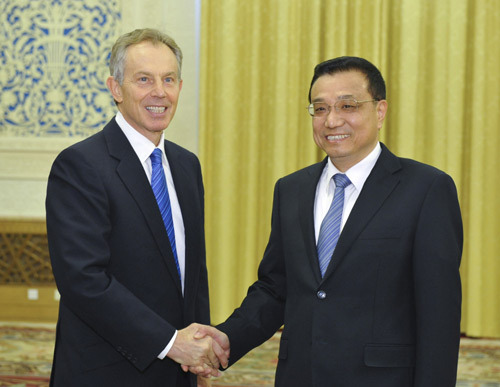 Blair was invited to China by the Chinese People's Institute of Foreign Affairs.